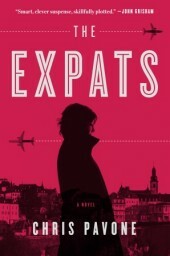 The Expats is a spy thriller that also spends plenty of time on domestic issues. The expats of the title are Kate and Dexter Moore. Kate has kept her job with the CIA a secret from her husband and two young children, and she leaves her position when her husband accepts a lucrative job in Luxembourg in the field of IT security. After a somewhat slow beginning, it’s a novel concerned mostly with plot: it is a suspenseful spy novel, after all. The first section of the book revolves around Kate coming to terms with her choice to leave the CIA when her family moves abroad. Adjusting to the unpaid work of parenting in a foreign country is quite difficult for her. The fun parts of the novel are unraveling the conspiracies and motives of all the characters. The main action concerns Kate and Dexter’s dealings with another American expat couple, Bill and Julia of Chicago. The story is full of twists and secrets, all the way to the end. What I appreciated about the plot is that even when I figured out a few bits, there were still more things that I did not predict. The novel, while proceeding with Kate’s investigation into the Macleans, also looks back at her CIA career. As the novel progresses, we learn more and more about her career both as a field agent and what prompted her to switch from field work to ananalyst position out of the field. Those parts of the story were interesting, but, to be honest, the character of Kate left me a little bit cold. I think it’s because Kate herself is a bit cold and removed and constantly worrying about her husband finding out about her past. The Expats will appeal to spy thriller fans. It’s not the typical Cold War spy novel since it takes place in the present, but the human elements and the financial intrigue are interesting hooks.